Last season's FA Cup campaign for the teams in the Ryman Premier Division ended at the Fourth Qualifying Round stage as AFC Hornchurch lost to Skrill Premier side Hereford United (0-1 at Bridge Avenue in front of 739), Hampton and Richmond Borough lost away to Skrill North side Gloucester City (3-1 in front of 683) and Canvey Island lost on the road at Biggleswade Town of the Calor League Premier Division (1-0 with a crowd of 678. There were other representatives of the league from Division One's North and South in the 4th Qualifying Round. Needham Market narrowly lost 0-1 to Skrill Premier side Cambridge United at Bloomfields with a massive crowd of 1,784 watching, Chatham Town lost 0-2 at home to Calor Premier side St Albans City (crowd - 849) and Heybridge Swifts went down at Skrill South Boreham Wood (1-0 with just 237 watching). The prize money on offer from the Football Association is good and with the added exposure a glorious cup run brings it means more people through the gates at clubs which is all good. Some of the Premier League giants may now treat the world's greatest cup competition as a distraction to the race for survival or European places but at non-league level it means everything to the fans, players and club officials. In prize money alone Needham Market's run from the Prelimanary Round to the Fourth Qualifying Round netted the club £16,925! As you can see there are lots or either/ors with the Extra Preliminary and Preliminary Round taking place beforehand. There are only two all Ryman Premier ties with AFC Hornchurch welcoming East Thurrock United and VCD Athletic hosting Hampton and Richmond Borough. The Cold End's team Enfield Town will have either a local derby versus Division One (North) side Ware or welcome Essex Senior League Tower Hamlets or Felixstowe and Walton United of the Thurlow Nunn Eastern Counties League. 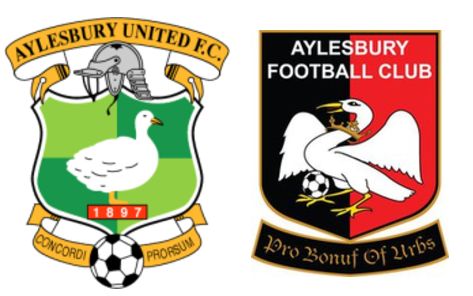 The most interesting tie of the Preliminary Round must be the Aylesbury United v Aylesbury FC local derby game. Both teams now play in the Calor League central division with the two league games between the two rivals ending Aylesbury United 1 Aylesbury 3 (476 Monday 26th August 2013 @ Bell Close, Leighton Buzzard) and Aylesbury 3 Aylesbury United 1 (549 Tuesday 1st April 2014 @ Haywood Way, Aylesbury). The game will take place at Bell Close which is the home of Leighton Town where The Ducks have groundshared since 2009. Expect a 500+ crowd at this game!